VC-1 includes a total of 3 unique chorus models including Analog (BBD), Digital and VintageDigital. With support for Audio Unit Extensions, AudioBus, InterApp and USB-Audio VC-1 fits in every setup. From input to ouput, VC-1 applies true stereo processing in every step of the signal chain. VC-1 supports all the standards you might expect to find in a modern iOS Music Application. VC-1 is built as a Audio Unit Extension, use it like a plug-in in your DAW. With Inter-App Audio you can use VC-1 when recording into other apps such as Garageband. 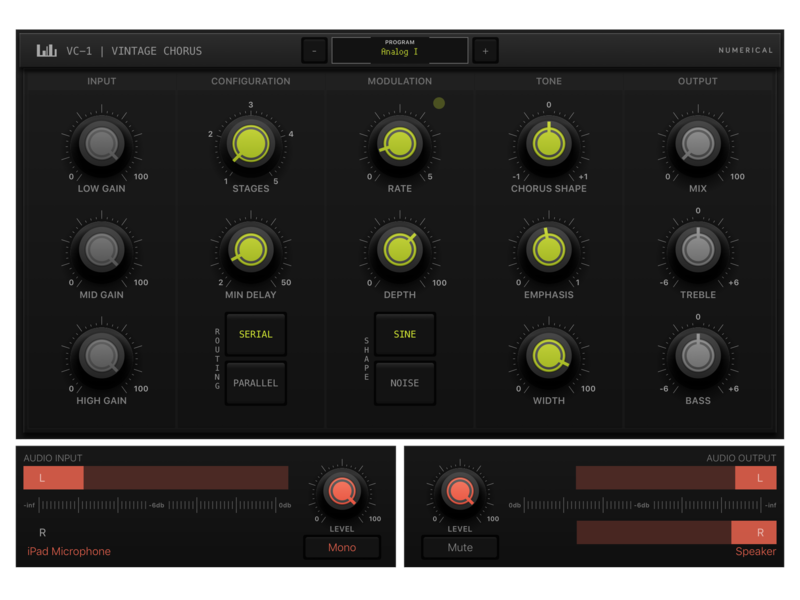 Use VC-1 as a AudioBus Filter to process audio from virtually any other app. Sync VC-1's internal tempo with other Apps and Ableton Live. Aside from working great with other apps and technologies, VC-1 can handle external audio as well. Use VC-1 with an external audio interface to process audio while recording or setup VC-1 as a send effect on your mixing desk. Just want to have some fun? Connect VC-1 to the internal Microphone.